KUCHING: A group of keringkam enthusiasts will be publishing a book called ‘My Keringkam Stories’ after collecting 100 keringkam-related stories. 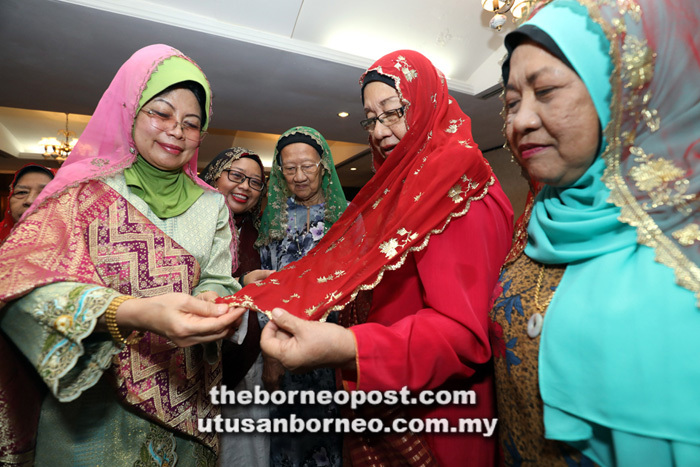 Minister of Welfare, Community Well Being, Women, Family and Childhood Development Dato Sri Fatimah Abdullah said keringkam is a cultural fashion textile which has almost become a forgotten tradition of the Sarawak Malay community. “Keringkam, an almost lost Sarawak Malay tradition, should be preserved. It reflects the identity of Sarawak Malay women and thus, I fully support this (book) project,” she said at the ‘teaser’ launching ceremony of My Keringkam Stories here yesterday. The project is initiated and organised by Salliza Sideni, Patricia Peng, Danny Mohamad Zulkifli and Amirul Shazie Yusuf. It aims to revive the tradition, culture and history of keringkam. Besides using the traditional motifs on scarves, Fatimah said young artisans can consider using keringkam embroidery for baju kurung, kebaya, head accessories and hand accessories. “There are only a few artisans doing keringkam. In the past, it was worn by aristocratic women to special functions like weddings,” she added. Shorter keringkam scarves that cover the head and shoulders are known as ‘selayah keringkam’, while longer ones – ‘selendang keringkam’ – can reach the waist. Gold and silver coated thread is used to embroider the motifs. As part of the launching of My Keringkam Stories, a keringkam exhibition was held showcasing scarves made between 45 and 60 years ago, along with some believed to be 100 years old.